Damion Fletcher ran for 78 yards on 17 carries on the day to bring his season total to 1,015 and become just the ninth player in NCAA-FBS history to run for 1,000 yards all four seasons in the loss. Michael McGee blocked a Troy field goal in OT to give Southern Miss the victory in one of the 2008 Bowl Season's best games. Ben Mauk and No. 20 Cincinnati spoiled Jeff Bower's farewell. Damion Fletcher ran for two touchdowns and Southern Miss scored 21 points in the second quarter en route to a 28-7 victory over Ohio. Played in Lafayette, Louisiana due to Hurricane Katrina. All-American, Michael Boley and 2004 New Orleans bowl MVP returned an interception 62 yards for a touchdown early in the fourth quarter and finished with eight tackles, including two sacks. Utah's dominating defense set up one score and returned a fumble for another, No. 25 Utah handed the Golden Eagles a 17-0 loss in the 45th annual Liberty Bowl. Even without star running back Derrick Nix, and QB Micky D'Angelo lost early, the Eagles played better than expected showing tremendous heart. This game was widely recognized as one of the best bowl games of the 2002 Bowl Season. A 29-yard touchdown pass from Jeff Kelly to Kenneth Johnson with eight seconds remaining lifted Southern Miss to a thrilling 28-21 win over No. 13 TCU and current NFL star LaDainian Tomlinson in Mobile, Ala.
Southern Miss edged Colorado State 23-17 in Memphis by holding the Rams scoreless in the second half despite 19 minutes on defense. The Golden Eagles were 17-point favorites, but the Vandals pulled off one of the biggest upsets in bowl history. Five lost fumbles proved costly in a 42-35 loss to Idaho in Boise. The Golden Eagles blew an early 21-7 lead. Southern Miss destroyed Pitt by the most decisive margin in Liberty Bowl history. The Golden Eagles capped a undefeated Conference USA season by overpowering Pittsburgh 41-7 in Memphis. Brett Favre threw for 341 yards and two touchdowns, but it wasn't enough as North Carolina State topped USM 31-27 in Birmingham. James Henry returned two punts for touchdowns as the Golden Eagles got the best of UTEP 38-18 in Shreveport. Missouri made four field goals in a 19-17 win over USM in Orlando. 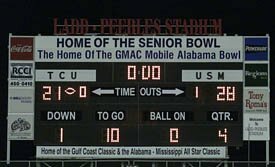 The Golden Eagles never held a lead. Mike Woodward's 1-yard touchdown run with 1:17 to play gave USM a hard-fought 16-14 win over McNeese State in Shreveport. Although Mississippi Southern was a touchdown favorite, score one for the other side of the Lone Star State. East Texas State prevailed 10-9 in a defensive battle in Orlando. A 75-yard interception return for a touchdown sparked West Texas State to a 20-13 triumph in Orlando. Texas Western (now UTEP) made the most of its home-field advantage by rolling to a 37-14 triumph. The Southern's bowl debut wasn't that memorable as Pacific cruised to a 26-7 decision in El Paso. Jeff Kelly (QB) threaded a 29-yard touchdown pass to freshman Kenny Johnson with eight seconds left to defeat #13 TCU. 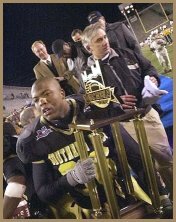 "Adalius Thomas had three sacks and the Golden Eagles converted three turnovers into 10 points in a 23-17 victory over Colorado State, winning the Liberty Bowl for the second time in three years." USM defense contains Pittsburgh to 13-of-29 passing for 172 yards and three interceptions, two of which were returned for fourth-quarter touchdowns. 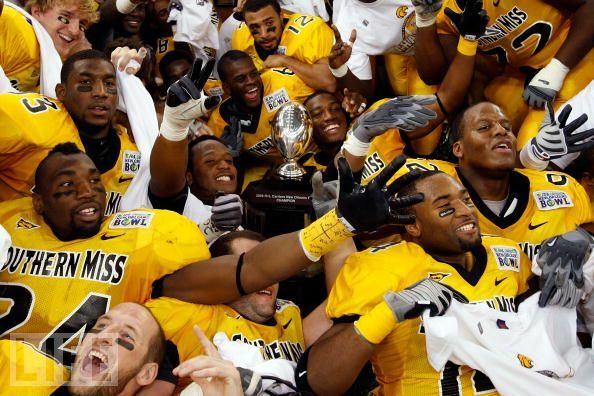 Michael McGee blocked a Troy field goal in OT to give Southern Miss the 2008 N.O. Bowl Championship.